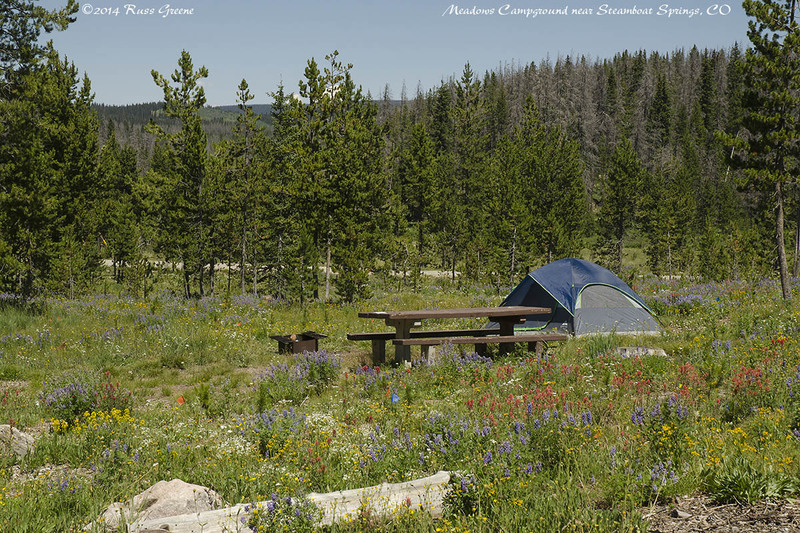 Meadows Campground is a Forest Service campground in the Routt National Forest (sometimes known as the Medicine Bow Routt) along US 40 about 15 miles east of Steamboat Springs, CO. Google Maps link. It is near Rabbit Ears Pass at an elevation of about 9300′. 7 miles of the journey from Steamboat Springs is up a 7% grade. Campground Host: There was a volunteer host when I camped there. When I arrived during a weekday in early August the campground was probably less than half full, but it filled up pretty well over the weekend only to empty out again during the next week. The campground is largely wooded. When I was there an abundance of wildflowers delighted the eye and wild strawberries were growing alongside the road into the campground. 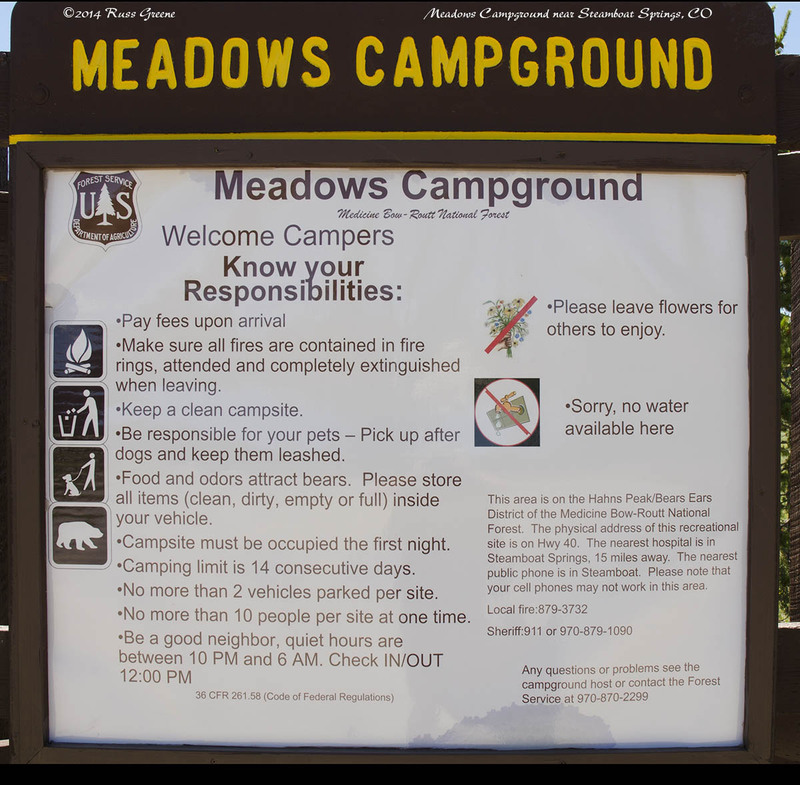 It would appear that the campground was named Meadows because it is adjacent to a meadow. During my stay the campground was a popular hangout for hummingbirds. My neighbors had a hummingbird feeder on their picnic table and I once counted as many as 10 of the little birds feeding and hovering around. The road to the campground from 40 is dirt and gravel with a few small potholes but I don’t think the condition of the road should deter anybody. It’s only a few tenths of a mile to the campground. A couple of the sites are walk-ins. Many are suitable for RVs. My 33′ Class C fit in space 13 easily with room for a towed vehicle. 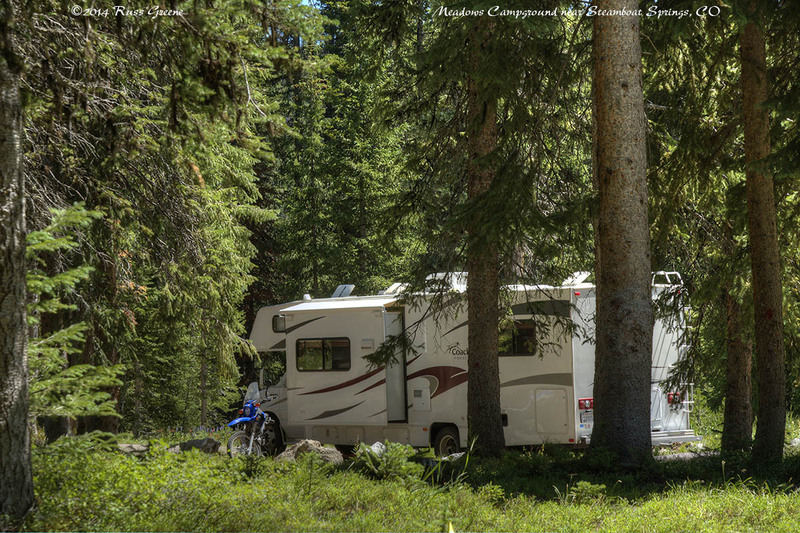 Quite a few other sites can handle RVs that size or even larger. 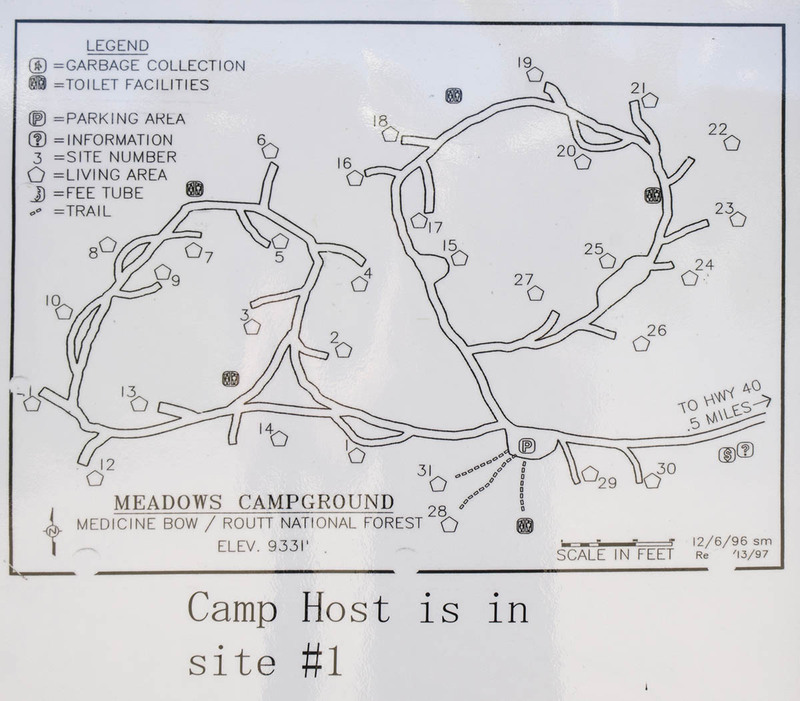 Sites 1-14 in the loop on the left (see campground map), are more shaded in general than those in the loop on the right. Some sites are more level than others but you can probably expect to need to level your RV in most if not all of them. Tent campers have to fend for themselves when it comes time to pitch a tent as tent pads are not provided. In that sense this campground seems more suitable for RVers. Although the campground is adjacent to US 40 and traffic can be heard, there are often periods of several minutes between vehicles one can hear. At night, inside my RV I didn’t notice much traffic, if any. I’d say it’s pretty quiet as campgrounds go. 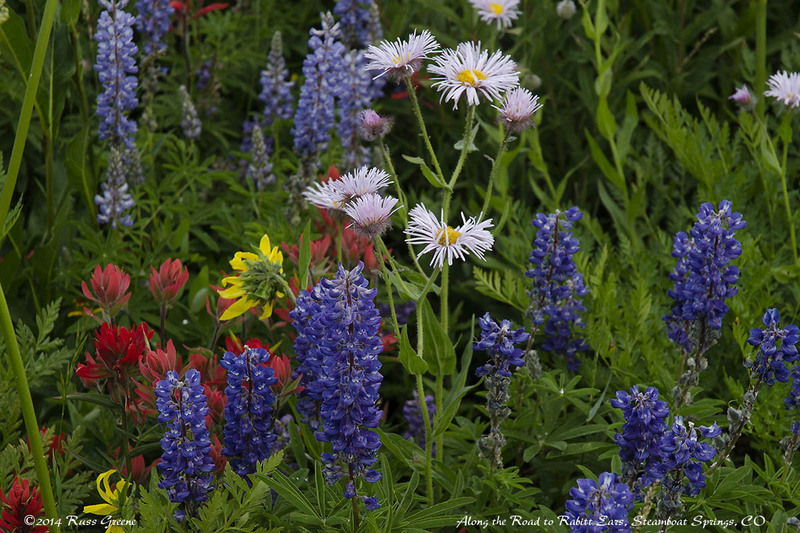 People come to Steamboat Springs in the winter to ski, and in the summer to hike, bike, and petal-peep as the wildflower displays in the area can be just spectacular. Look for the one near Rabbit Ears Pass. I’m not an expert on the area so you’ll want to research reasons to other come here. You might start with the Chamber of Commerce. “Boat” as the locals sometimes refer to Steamboat Springs is large enough to have a Walmart, Safeway, City Market, and a natural food grocery. There are several local beer breweries. In the summer there are free concerts. There are kids activities, a museum, a farmers market, hot springs and spas. There is a terrific, newish library with lots of public computers, free WiFi and a tiny coffee shop. The town is still small enough that there are no parking meters. Meadows Campground rules. Note, there is no water. No hookups of any kind. There is a trash hopper as well as vault toilets. 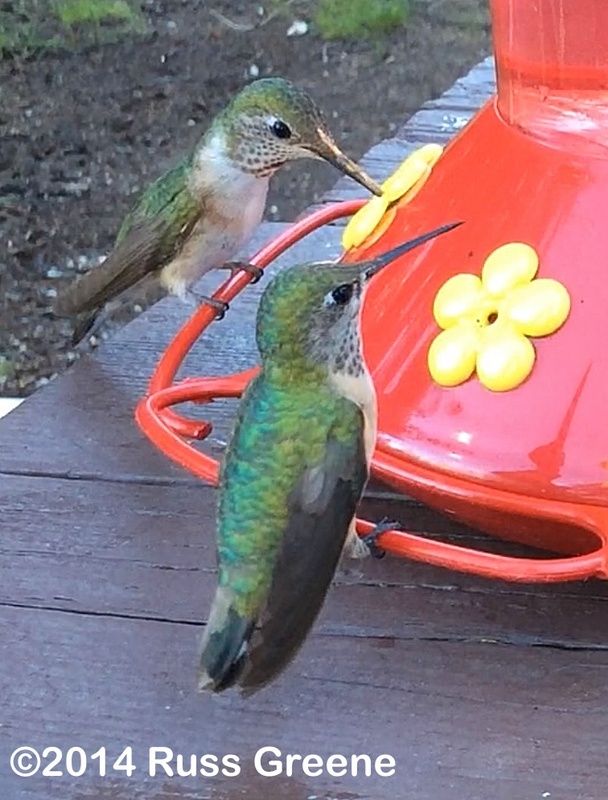 I counted as many as 10 hummingbirds hanging around my neighbor’s feeder and they didn’t mind you getting to within a couple feet of them. Quiet time ends at 6am! How often are people a nuisance in the mornings?? I can’t tell if you’re trying to make a point or if you really want an answer to your question. I can’t answer it, of course. I don’t think that’s a statistic anybody keeps track of. Wow! 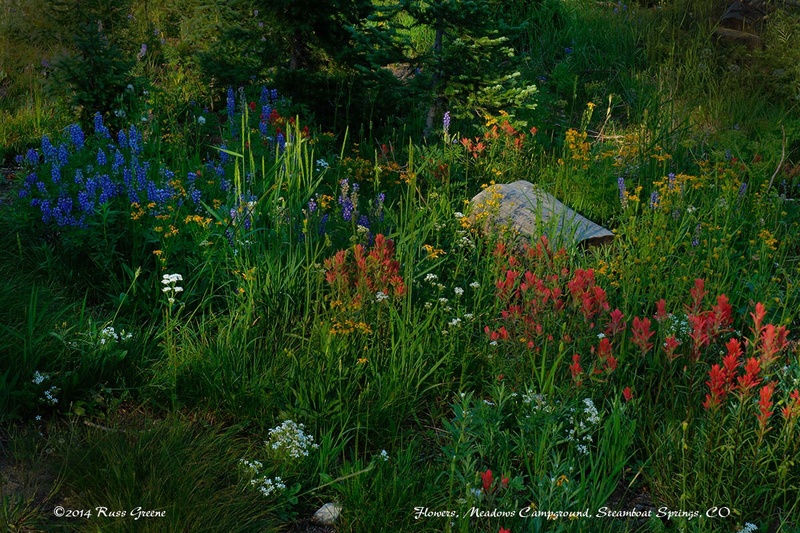 what beautiful wild flowers – mountain wild flowers are just the best- and what deep gorgeous colors! How lucky to find them and see them and…photograph these gems!!! It was pretty special… Overall, the places I’ve visited in Colorado have provided probably the most abundant wildflower viewing I’ve had.